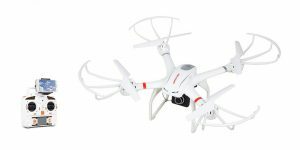 This drone is ideal for beginners because it has a good flight time of 8 – 10 minutes and control range 100 meters.It comes with 2MP camera and has some useful features like Headless mode and One-Key return.MJX X101C is popular among new dronelovers who are looking for good but not too expensive quadcopter. Another drone manufactured by WLTOYS, V393 is brushless motors upgraded version of the V262.It comes in different version and colors.Drone is protected by strong and durable frame.It is large quadcopter but its powerful motors allow him good stability in air.Control distance is 130 meters and flight time is 12 minutes which is great for such large drone. 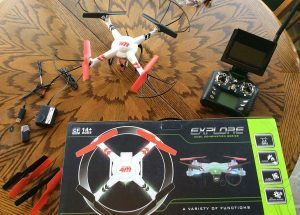 U818S is great drone but it work perfectly with HomeBoat transmitter FPV set.Drone has four high speed magnetic motors and uses 850 mAh battery.All this together allow him to fly 150 meters in distance up to 10 minutes.It comes with 2 MP camera which is FPV ready. First racing drone in our list, it has a weird design but that is for its function to be as fastest as can.It is very durable drone, made from carbon fiber so it will survive crashes.It comes with camera but it is not ready to fly so you have to put in together which can be interesting because you can add some parts that you want to have on it. One of the most popular drones in our list, Cheerson CX-20 is great and powerful quadcopter with capability to carry Go-Pro camera.It comes with cool features like: Intelligent Orientation Control and return to home function.When battery gets too low it automatically lands to itself to avoid crashes.Flight time is 10 to 15 minutes and control range is 300 meters. 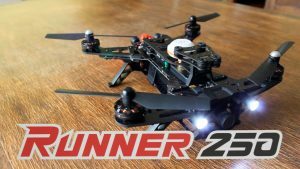 Another racing drone in our list, Runner 250 is amazing machine.It can flight up to 40 km/h.This speed in combination with good control distance(1000 meters) and flight time up to 15 minutes makes this drone ideal for racing.It is made from carbon so crashes would’t have any impact on it. Blade 200 QX is really powerful drone.It produces enough power to fly with Go-Pro camera.You can perform acrobatic flights with it and it is stable so much that you even don’t need to control to mantain balance in the air.During a flight you can choose between 3 modes, stability mode, 3D stagility mode and 3D agility mode which is for acrobatic flight. First place and title of best drone under $300 goes to Parrot AR drone 2.0,drone with best design and features.It has cool design and comes in three different version(Snow, Sand and Jungle edition).Frame protects propellers and motors.It doesn’t come with controller but you need to download a free app called AR.FreeFlight on your Android or IOS and then you can control your drone.Also, you can upload videos and photos on app.